CURE, Minnesota Master Naturalists (MMN) and the Chippewa County Historical Society with the support of the Chippewa Soil & Water Conservation District will team up to remove buckthorn at the Lac qui Parle Mission as part of the National Public Lands Day (NPLD) day of action. 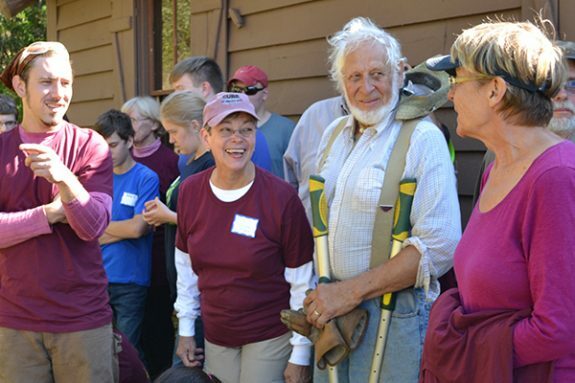 This is the nation’s largest single-day volunteer effort for America’s public lands. September 30th marks the 24th annual celebration and we would love for you to join us. We have chosen buckthorn removal because buckthorn plants out-compete native plants for nutrients, light, and moisture. Buckthorn degrades wildlife habitat and threatens the future of forests, wetlands, prairies, and other natural habitats. Buckthorn contributes to erosion by shading out other plants that grow on the forest floor, and serve as host to other pests, such as crown rust fungus and soybean aphid. Buckthorn also lacks “natural controls” like insects or disease that would curb its growth. Working to conserve and protect public space is important to both CURE and the Minnesota Master Naturalist program. The Mission is a perfect place to provide conservation support and removal of the buckthorn will make strides in that effort. The National Public Lands Day is a great way for anyone values outdoor public spaces to come and give a hand. We will begin at 9 am with a brief history of the Mission, orientation to the project, (comma added) and a safety overview. We will break at 12:30 pm for lunch and those who which to remain may continue. What to bring: You should dress in long pants and long sleeves in layers. Participants need to wear closed-toe footwear (boots are recommended). You should bring sunscreen, bug spray, a hat, and working gloves. Participants are encouraged to bring loppers, hand pruners, and pruning saws you have them. We also need a couple gas powered weed whips. (Please call and let us know if you have one.) You should come with a water bottle – we will have some additional water on site. Activity Level: There are no special skills to participate in this activity but we will be on uneven ground and moving debris. If you would like to help with other projects less physically demanding, please let us know as we should have a few other things we need help with on that day. Fees: This event is FREE and family friendly (Those 16 and under should be accompanied by an adult.) We will be providing lunch and t-shirts for those who pre-register. To register: Please the Minnesota Master Naturalist site and scroll down to the National Public Lands Day events. (REGISTRATION is not open yet – we will email folks once Master Naturalist has it open.) SAVE THE DATE!!! If you have any questions, please feel free to contact Peg Furshong at peg@cureriver.org or by calling 320-269-2984.